Stunning inner city luxury and locale in New Farm. While an influx of new and innovative hotels has overtaken Brisbane’s city skyline, sometimes it’s nice to get into the groove of the city with a stay in someone’s home. From beach shacks to Manhattan-style lofts and even a converted church, we’re voting these the best of Brisbane’s private rentals. You’ll be hard pressed to get Hozier out of your head when you step through the ornate breezeways of this heritage-listed church in Petrie Terrace. High ceilings and stained-glass windows blend in perfectly with a modern makeover. Within walking distance to Suncorp Stadium, South Bank and the city, this four-bedroom holy abode is perfect for those who want to stay close to the action. Dolphins at Sunset on North Stradbroke Island. Whatever your previous notions of the Cast Away life might have been, scrap them, because this Amity Point beach house on Straddie is about to change everything. Sure, days spent to and fro-ing from the salty seas is enough of a reason to book in a chunk of time at this luxury holiday home, but throw in sunset dolphin visits at your own private jetty? Whether it’s a cosy winter escape or some much needed time-out from the daily grind that’s got you running for the hinterland, whenever you’re in need of some R&R, the Mount Glorious Getaway Cottages have got you sorted. Just a one-hour drive from Brisbane, you’ll feel worlds away as you hole up in your own rainforest sanctuary, tucked deep in the Maiala National Park. It’s pretty much a sure thing that a home owned by an interior designer is going to ooze serious style, so if you like your stays a little bit fancy, splurge on this luxe New Farm property. Boasting three different living areas (including a dark media room), four bedrooms and a large outdoor entertaining area with pool, this Queensland stunner is straight out of the pages of an interiors magazine. An incredible example of enviro-luxury, this architectural masterpiece is located smack bang in the beating heart of Brisbane, and is decked out with all things eco-friendly and sustainable: from the patterned solar-screens right down to the organic oils in the bathrooms. Sleeping up to four people, it’s the go-to city stay for couples and small families. Live like a local in the beautiful three-bedroom renovated Federation home, close enough to take in the sights without having the hustle and bustle at your doorstep. Off-street parking and nearby public transport and motorways make getting around a breeze. Most people love Brisbane for the trendy inner-city ’burbs, but for a change of pace, head north to this charming retro cottage in Scarborough, where you can spend your days eating fish and chips and exploring the parks and sandy beaches dotting the coast down to Redcliffe. 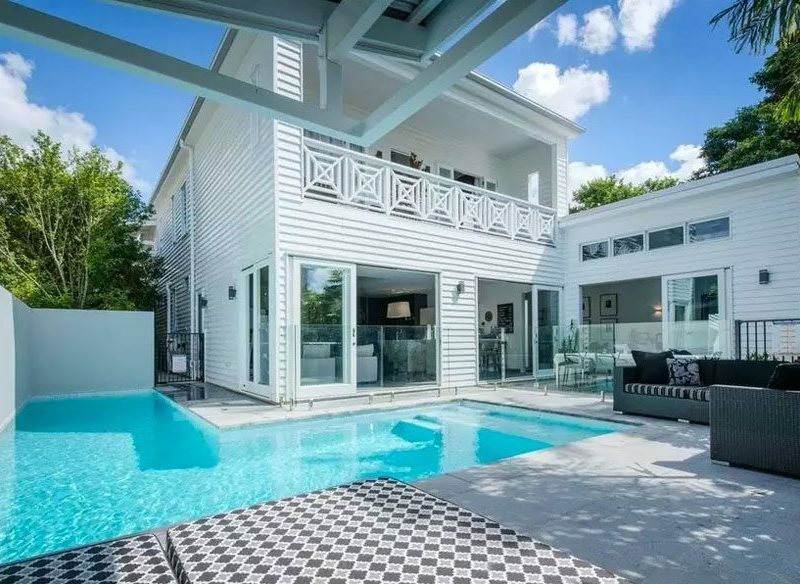 With cool sea breezes wafting in from the balcony and a palm tree-studded garden paradise at your window, you’ll almost forget you’re in a city staying at this five-bedroom Manly home. The spacious Queenslander is great for big families, with both upstairs and downstairs living areas (perfect for moody teenagers) and the esplanade and Harbour Village close by. Perched on the banks of the Brisbane River, this Manhattan-style loft is ideal for couples and lone wolves. Sleek designer furnishings offset high ceilings, huge windows and internal brick walls, while crossfit and yoga studios, craft breweries, and restaurants are all within metres of your front door. Picture this: waking up in your own rooftop bedroom and staring out into a 100-year-old rainforest… not what you would expect of a city stay, right? But this hidden escape is only three kilometres from the CBD, and feels like it could be the home of fairies with its delicate feminine touches and leafy surroundings.